What is the definition of quality music? The answer is always varied and not only by the genre of music you prefer because there are varied tastes within any genre itself. Some bands that rock hard you may not like while some bands that do not rock may be to your liking. What does that have to do with this review? Not much. I just thought I'd toss my opinion out there for readers of Rough Edge to think about. 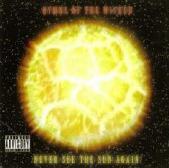 Hymns of he Wicked's "Never See The Sun Again" rocks like a mo fo from the first track to the last. I was simply blown away by the sheer force and distinct style of the music on this CD. The band's unique style held me captive throughout, with their absolute dedication to what they were doing transmitted in every chord and note of the music. This CD has a shot at making my Top 10 of 2006; it's that good and that original. Frankly, I may not have liked each and every cut of the release, but those that I did, I liked with deep conviction. For more information, check out http://www.hymnsofthewicked.com. Revised: 11 Jul 2017 13:44:31 -0400 .